Credit Union Email: Phishing or Not? The link leading to that page was on their website, but the page is on trabian.com, whoever they are. Should I trust the links on that page to return me to the credit union site or not? It claims to be from the credit union, but does its actual address (insofar as anything concerning email can be actual) of statement2web.com sound a little phishy to you, too? So the email started from statement2web.com and bankshotted off kbmla.com. Further up, the headers show it rattled through pobox.com and eventually arrived in my inbox. 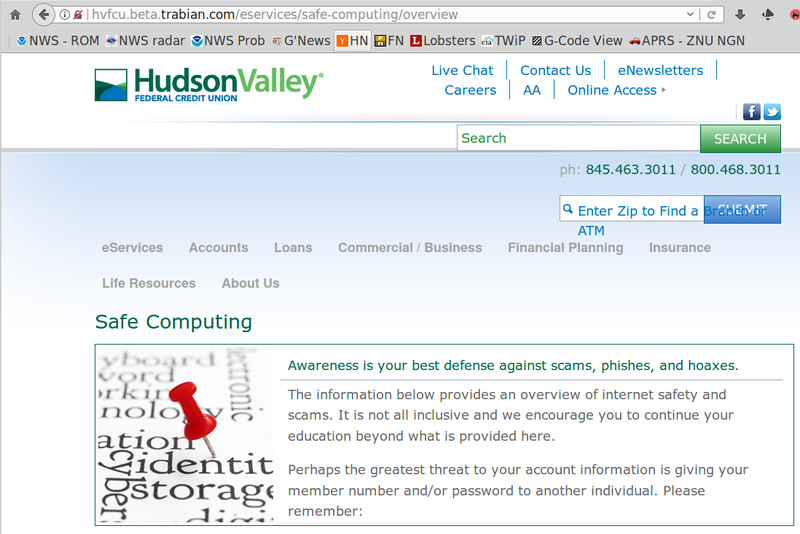 As far as I can tell, it never touched its alleged starting point of hvfcu.org at any point in its journey. Quick: phish or no phish? Of course, it’s a perfectly innocent message from the credit union, but it contains every single warning sign we’re supposed to notice in spam or phishing emails, complete with a clicky link! This entry was posted on 2017-03-12, 07:04 and is filed under Home Ec, Oddities. You can follow any responses to this entry through RSS 2.0. Both comments and pings are currently closed. And when you report this to them, you’ll get a big ‘huh?’ From them as well. . I might point ’em to this writeup, but, fer shure, that’s as far as it’ll go.